Over 100 years of club history together in a board game: From climbing the DFB Cup final of 1994 on the theft of the sword out of the city of Münster to the gate of the Month of Alexander Thamm - The new RWE Monopoly, the club provides a fun journey through the traditional past. RWE proves that you need neither glamorous nor glitters to be a proud football club, the club with roots in the mining environment trumps with humor and fun of the game. "Rising from the Ruins" had been in a semi-demolished stadium a good time, and therefore consistent with the Monopoly RWE not the vile numbers in focus, but the whole world the harbor road: their stories, their experiences and their people: teams, the club, its fans! 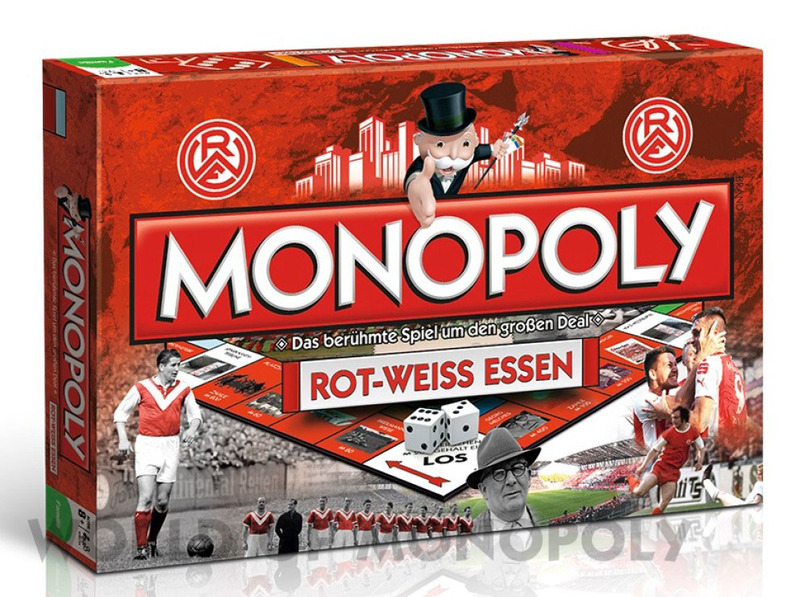 Money not score goals and attention to RWE is not for sale, but with the Monopoly RWE one creates his personal red-white home as a board game, even after the game, at home in the living room. Rot-Weiss Essen, Georg and Heinrich Melches is German football league and cup, is tradition and identification with the city. When RWE Monopoly players collect no roads, but places, moments and legends of the club's history. Players embark on the trail of the greatest club successes and legends and at the same time meet the authentic and historically justified setbacks of their association with the dose of self-irony, which makes the traditional association of the harbor road so unique. 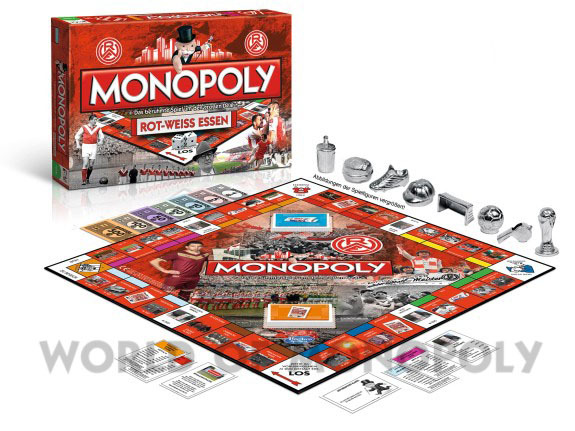 Monopoly, the world famous game of land and real estate leads with this very special edition of the club history of one of Germany's most prestigious football clubs: Rot-Weiss Essen. 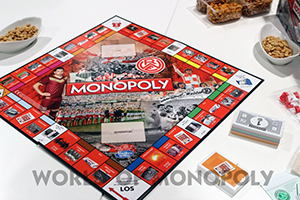 In this special edition Monopoly no roads are collected, but historical places, moments and people from the club's history. Also Friesenstube, Hafenstubchen and Melches hut may, of course, as a color group as little as missing the World Cup players! Build stands in your own fields and strive for the possession of entire color group, then stages can build and yet more rent to be taken! 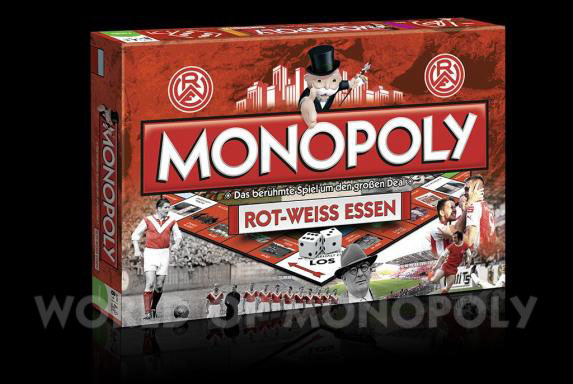 Instead stations offer the Rot-Weiss Essen Monopoly the four stands of the new stadium a reliable source of income. 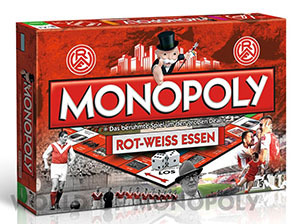 Instead of Community and event tickets actions by WAZ and the Reviersport be announced: Alexander Thamm score the goal of the month, you will get 100 Monopoly dollars, but pay just as much, if you steal the sword of Münster. Taxes are not paid in this edition, however, are upon landing on the corresponding fields "space storm" and to pay "Pyrotechnics" severe penalties. 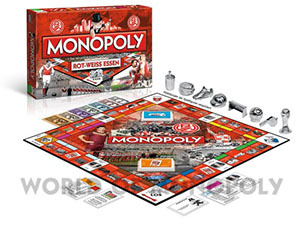 And what are probably the "most expensive streets" in Monopoly Edition Rot-Weiss Essen? Of course, the legendary brothers Henry and George Melches!